The SafeContractor certificate awarded to Jacopa by Alcumus, a leading third-party certification and accreditation body, recognises rigorous standards in health and safety management among contractors, and has over 28,000 contractor members UK-wide. The scheme provides a health and safety audit service for contractors who want to reassure their clients that health and safety is being managed expertly and diligently on their sites. Qualified auditors review applicants’ health and safety policies, procedures and documentation. Jacopa’s application for SafeContractor accreditation reflects its on-going drive to achieve and retain the highest standards of health and safety practice within the organisation at all levels. The award verifies that the company has achieved a uniform standard of excellence across the business. Gemma Archibald, Director of Alcumus SafeContractor, said, “Major organisations simply cannot afford to run the risk of employing contractors who are not able to prove they have sound health and safety policies in place. 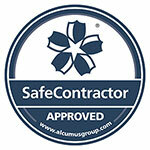 Jacopa Managing Director, Alex Lloyd, said, “We are delighted to have achieved accreditation to SafeContractor by Alcumus. The process is demanding but extremely worthwhile, because it enables our clients to have complete confidence that we will approach every contract with absolute respect for and compliance with all health and safety requirements.